A team of dental students from Plymouth University Peninsula Schools of Medicine and Dentistry have been working with sport students from the University of St Mark and St John, to raise awareness of the hidden dangers to teeth of sugary energy drinks and snacks. 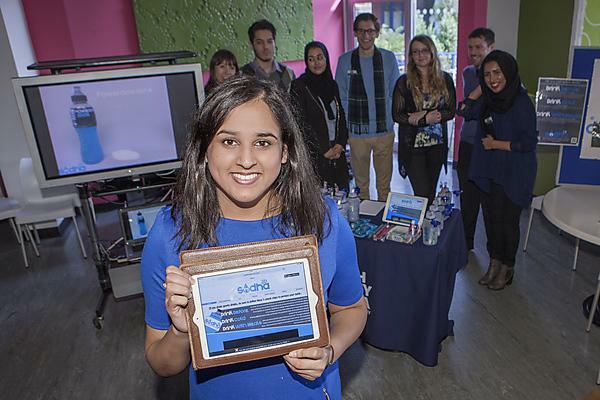 The project is part of the dental students’ Inter Professional Engagement scheme which is part of their studies, and which sees them interact with a variety of groups within the wider community. The IPE scheme is run by the Peninsula Dental Social Enterprise. The project comes at a time when charity Action on Sugar has called for the sale of energy drinks to children to be banned. The charity said energy drinks contained up to 78g of sugar per 500ml - more than three times the 25g limit for women proposed by the Scientific Advisory Committee on Nutrition. The dental students ran a series of activities with the sport students, culminating in an information stand in the main dining hall at the University of St Mark and St John. They have also produced a website with further information for the sport students, and others who want to know more. "Oral health and hygiene education, specific to sports participants, has had relatively little coverage in the media or indeed within an academic research context. Although sports participants are aware of the nutritional and hydration requirements in order to perform in sport and exercise, manufacturers tend to 'sell' products on the performance benefits without considering the oral health aspects related to the product. In this aspect unless participants are made aware of the potential dangers of the content of sports drinks, nutritional bars and high energy foods then little or no progress can be made to protect them, or counter the negative outcomes, that result from their consumption. Clearly an educational program addressing this aspect, and raising awareness, is of vital importance for current and future generations participating in sport and exercise."